Posted on October 3, 2013 by J. Moving distracts your left brain so your right brain can do its job. Moving underscores what is happening dramatically and emotionally in the scene. Physical movement of this kind is, in some ways, unnatural. We are creatures of habit, we are. We sit in the same chair, tread well-worn paths in the carpeting, eat the same thing for breakfast , frequent the same places week after week. Most of us aren’t explorers; we’re observers. I think this is part of why we’re reluctant to move much on stage. We don’t give ourselves permission to be that free in our real lives, why should we behave any differently on stage? 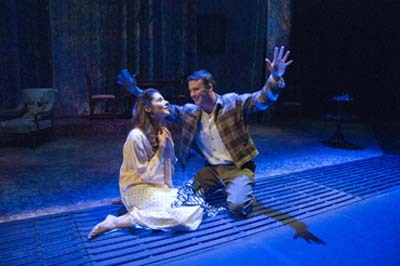 But everything on stage should be a little bigger than life – even Laura in The Glass Menagerie. Remember, this isn’t film, and you aren’t getting your close-up. What you do has to be big enough to carry over the footlights and to the rear of the house. So you’ve got two things to fight against. One is your own disinclination to stray out of whatever you consider to be your comfort zone. Inertia, in other words. The other is your fear of the unknown. What’s it like over on the other side of the stage? Is there a trapdoor I’ll fall through? Will I find my way back if I go over there? I know, this sounds silly. And it is. But it is also, truthfully, part of why you won’t go over there. And like most fears, the closer you look at it, the more you realize that you’re afraid of – nothing, really. Roaming all over the stage gives you a wonderful feeling of freedom. So leave a trail of breadcrumbs if you need to. But find reasons to use as much of the stage as you can as often as you can. Not every role will permit you to do this – Laura, for instance is emotionally constrained and her physicality should reflect this (but in a bigger than life way). But when your roles do allow it, it makes for theater that’s really interesting to watch! See Part I here. See Part II here. This entry was posted in Acting, Action and tagged Acting, acting technique, Actor, Blocking, Community Theater, Stage movement. Bookmark the permalink.